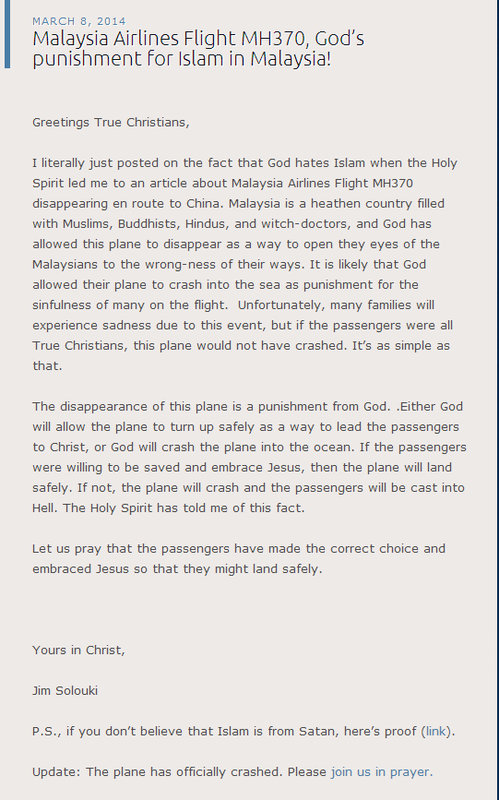 There has been a lot of articles shared on my newsfeed lately about the missing MH370 flight. There were people poking fun at our submarines, to the self-appointed newscaster, to the suddenly religious, to the blamers, but this reaction has got to be the most epic of them all. Also happened to be the one that caught my eye, despite my initial resolve to not post anything about the flight until the fate of the aircraft was confirmed. Taken from a Creation Science Study wordpress page. Not sure if he truly believes what he spouts (which will make him a fanatical Christian), or is he intentionally writing sarcastically to make people hate religion. I think it's the latter though, since he's operating anonymously and seemed to be painting almost everything on earth as evil, based on all his previous posts. And I seemed to suspect that he enjoys the attention too, by writing about sensitive or popular subjects. In classic internet language, he's a troll. So don't give him the attention. I just find it sad how people seem to find fulfillment by playing on other people's misery.